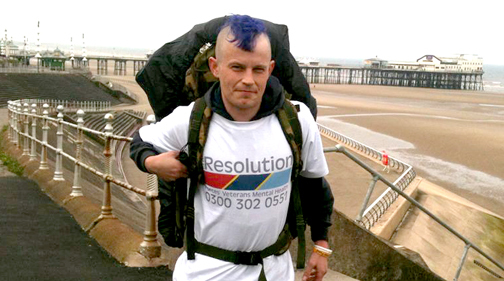 A former serviceman from North West England is walking around the entire British coastline to help Veterans get free treatment from PTSD Resolution. The charity helps veterans, reservists and their families who are struggling to settle back into a normal work and family life because of military trauma suffered during service in the armed forces. Military trauma can cause flashbacks, nightmares, anger and depression - often leading to violence, alcohol and substance abuse, job loss, family breakdown and even suicide. The programme is complementary to the work of other services' charities, in that it resolves the mental health issues that are barriers to successful reintegration and settlement. PTSD Resolution recently announced new research to confirm the effectiveness of the programme, and continue to raise awareness of the causes and treatment of post-traumatic stress. Military trauma remains little understood by veterans and reservists - or their families, friends or employers, the people who are often very much affected by the destructive behaviour associated with the condition. Sam Doyle, aged 30, served in the Royal Horse Artillery Regiment and the French Foreign Legion and has experienced PTSD since he was posted to Helmand Province, Afghanistan. Planning to walk every day for two years, he wants to increase awareness of PTSD while raising money along the way. He also hopes that his efforts will inspire other sufferers to seek help. Sam started his walk from Blackpool on the 28h May 2017. Travelling in a clockwise direction around the British coastline he will be relying on his survival skills gained in the military to serve him well throughout this gruelling challenge. The charity is encouraging members of the public to follow his progress and show their support when he travels to a location near them.